Hair loss is the nightmare of any woman. A bald head is more or less accepted as normal for men, but for women it stills triggers fear and rejection, showing how we unconsciously consider lush hair as an integral part of femininity. 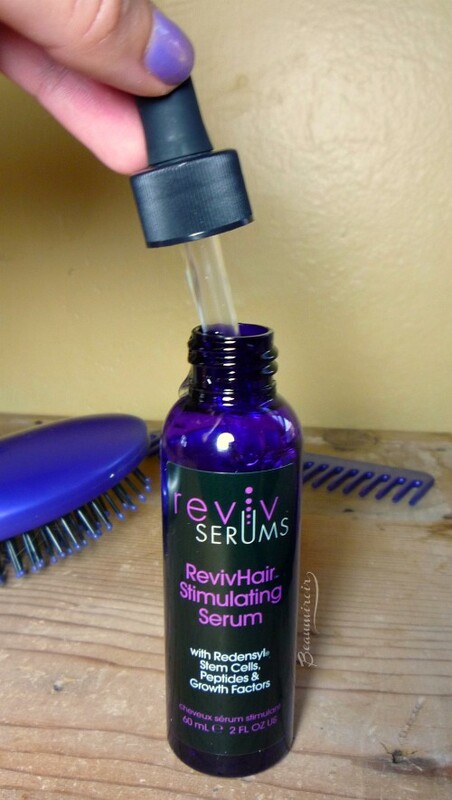 Today I want to talk to you about hair growth cycle, causes for hair loss, when it's normal and when you should start worrying, and review RevivHair Stimulating Serum by Reviv Serums. Keep in mind that I'm not a medical professional and that you should talk to your doctor if you have any concerns. This problem is something I have, unfortunately, an intimate knowledge of: in my early 20s I suffered from a sudden, prolonged and severe hair loss. Telling you I was freaking out doesn't even start to describe the state I was in. 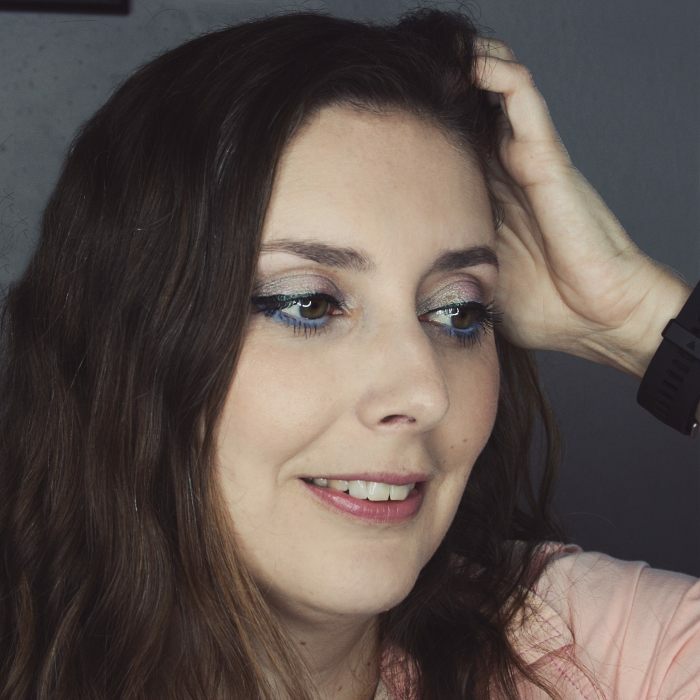 I was plagued by anxiety, very distressed, and also completely obsessed with that hair loss (I read everything I could find about hair growth and loss, that's why I know so much about it now!). I was finding handfuls of hair everywhere: on my pillow, on the collar and shoulders of my coat, on my office chair at work, on the floor... just everywhere. In a desperate attempt to feel in control I would count the number of individual hairs I was losing on my hair brush and in the shower, every day - yes I'm serious, and yes it took a good chunk of my time... I still remember the average count: I was losing 350 hairs per day or more, which is bad, very bad. I felt like the thinning was becoming very visible, although people around me were saying they couldn't tell, and the issue had a catastrophic impact on my self-esteem. I first went to my primary care physician, but she only suggested I take classic biotin supplements and they didn't have any effect. Eventually I went to see a dermatologist that specialized in hair loss. He prescribed an arm-long list of blood tests, and he also pulled out a strand of hair on three different areas of my head for analysis. The verdict came back after a few days: my hair loss was of the type tellogen effluvium, and caused by a severe iron deficiency. The dermatologist had me take iron supplements and vitamin E for a year, and it took about 6 months for the excessive hair loss to stop. That episode of my life was a real trauma, and I've lived in fear of losing my hair again ever since. 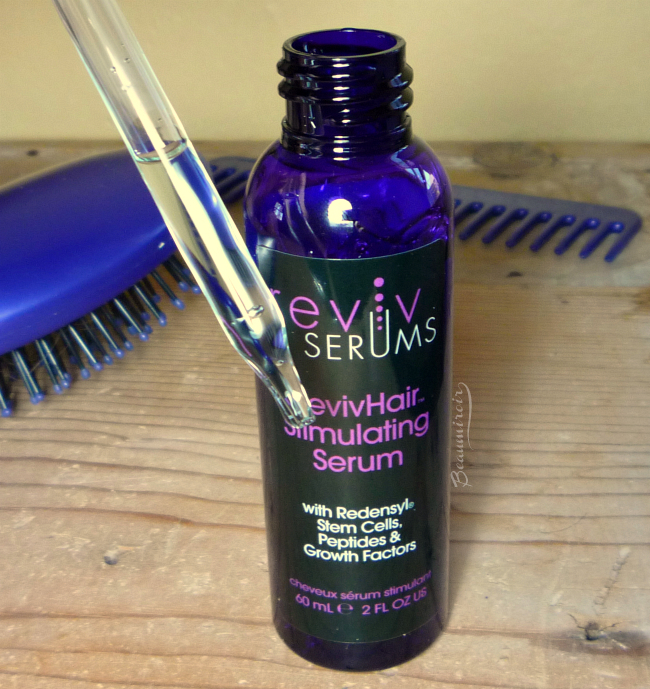 For that reason I've always been looking for products that can support healthy hair, and that's why I decided to test RevivHair Stimulating Serum. Because hair loss in men and women can be quite different, I also convinced my husband, the now world-famous Dr C, PhD, Beaumiroir's in-house scientist, to try the serum too! He suffers from classic male hair loss concentrated on the front and crown of the head, and I thought it would be interesting to see how the serum would work for him. But first, let's talk about hair, why we lose it and how. - the anagen phase is when your hair is actively growing. This phase lasts between 2 and 7 years depending on the person. At any given time, up to 90% of the hair follicles should be in this growing phase. - the catagen phase is when the hair stops growing. It's a transitional stage that only lasts 2 to 3 weeks, and stuff happens inside the hair follicle that changes the way the hair root looks. 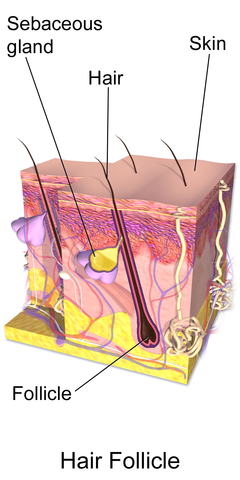 Just 1-2% of our hair follicles are in this phase at a time. - the telogen phase, also called the resting phase. At this point, the hair is effectively dead, not being "fed" by the follicle anymore, and it usually detaches within about 3 months to leave way for a brand new hair. 10 to 14% of the hair on our head should be in this phase. Since each individual hair is programmed to live for a certain amount of time before being replaced, losing a bit of hair every day is perfectly normal. Like I said earlier each hair follicle on your head can be at a different stage of the hair growth cycle since they're not synchronized. Sometimes, however, you can have more hair follicles in the telogen phase than usual and notice that you're losing more hair. This is fairly common, sometimes referred to as seasonal hair loss, and many people experience it in the spring or fall. This is not a cause for concern, since each lost hair is being replaced by a brand new one. Here's what I've been told by basically all the doctors I've talked to, including the hair loss specialist: it's completely normal to lose up to 100 hairs per day. You shouldn't worry about losing more than that for a couple weeks every now and then. However, if you lose more than 100 hairs per day for at least 2 months straight, you should consult your doctor, especially if you're a woman. - androgenetic alopecia: this is the typical male hair loss with receding hairline on the forehead and hair slowly thinning on the crown of the head. Women can also be affected, but they get a more diffuse thinning of the hair. The causes are genetic, with genes that make this type of hair loss more likely to happen, and hormonal, with male hormones playing a role, and aging. This type of hair loss isn't really reversible because hair follicles "shrink" under the influence of a testosterone derivative, first producing thinner hair, and eventually not producing hair at all. If you're a guy, you'll have to turn to topical treatments to try and contain the progression of the problem, or surgical solutions such as hair transplant. For women, other treatments may be available if there is a hormonal imbalance. - telogen effluvium: one of the most common types of hair loss in women, and what I suffered from. This is when you have a lot more than the normal 10 to 14% of your hair follicles in the telogen phase, ready to fall out (I had more than 30% of my hair in the telogen stage according to my tests during my hair loss episode). There are many reasons why this could happen: it's very common after childbirth, in case of anemia and/or iron deficiency (the cause in my case, and according to my doctor the most common reason for hair loss in women who have periods), diseases such as thyroid disorders, extreme stress or trauma, some medications. The good news is that telogen effluvium is completely reversible and that the hair will grow back normally when the underlying cause is taken care of. Any treatment will take a long time to show visible results, since hairs already in the telogen phase will keep falling for at least 3 months: there is just no way to "resuscitate" them back into the growing phase. 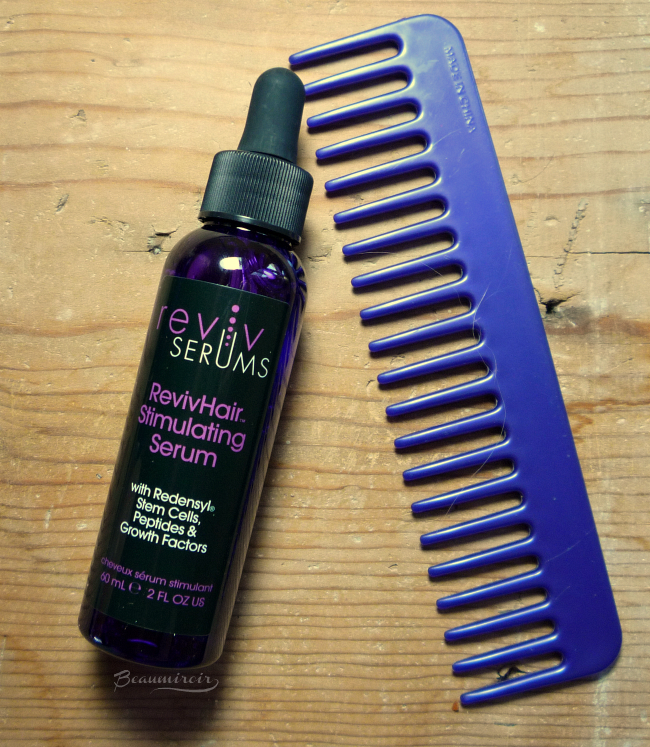 Created by San Francisco based Reviv Serum, the RevivHair treatment is formulated as a kind of anti-aging serum for your hair follicles. It's the first treatment available in North America to include Redensyl, a newly designed molecule which, according to its Swiss manufacturer, is more effective at stopping hair loss than minoxidil (the active component of Rogaine). If third-party studies confirmed this result it would be really exciting! Besides Redensyl, RevivHair contains a bunch of other molecules to address all the issues related to aging hair follicles: Keratinocyte Growth Factor to promote hair growth, a bunch of different peptides to help with micro-circulation and keep follicles healthy, and something called Methionine Sulfoxide Reductase that could slow down the arrival of the dreaded whites by preventing the death of melanocytes, responsible for hair color. There are also a bunch of stem cell cultures from Swiss apples, sea fennel and argan - they can each have their own antioxidant effect but don't expect them to start replacing your own stem cells. It's for the best really, you don't want sea fennel to grow on your head! RevivHair is intended for daily use by both men and women to make hair look stronger, denser and healthier. It's a clear gel that comes in a plastic purple bottle with a dropper. You're supposed to use one to two full droppers, dispensed on the areas where your hair needs the most help, and massage in with fingertips. Without further ado let me and Dr C tell you what we thought of this serum after more than 2 months of use! The gel is lightweight and has a very subtle scent that reminds me of lychee. It doesn't feel sticky at all and it doesn't leave any visible residue in the hair. I don't need to massage for very long to have it absorbed into the scalp. Something that I didn't expect but was pleased to notice is that it has an immediate volumizing effect. After massaging it in my roots are definitely lifted and look fuller. It doesn't weigh the hair down at all, nor does it stick it together or feel like cardboard like hair gels do. Looking at the ingredients list, I was quite impressed to see that this serum is almost all useful ingredients, no fillers. It's quite common to have the first 4 or 5 ingredients in haircare products be just texture agents, silicones and the like, but this is not how RevivHair is formulated. Just after water starts a long list of molecules and substances that Reviv mentions in their description: peptides, stem cells, growth factor... There are also a ton of plant extracts in there, from green tea to horse chestnut or nettle! Here's the full ingredients list: Water/Aqua/Eau (and) Glycerin (and) Sodium Metabisulfite (and) Glycine (and) Larix Europaea Wood Extract (and) Zinc Chloride (and) Camellia Sinensis Leaf Extract, Palmitoyl Tripeptide, Malus Domestica Fruit Cell Culture Extract [Malus stem cells], Tripeptide (AHK), Myristoyl Pentapeptide-17, Keratinocyte Growth Factor (KGF, rh-Polypeptide-3), Biotinoyl Tripeptide-1, Acetyl Tetrapeptide-3, Argania Spinosa Sprout Cell Extract, PEG/PPG-20/23 Dimethicone, Mannitol (and) Ammonium Glycyrrhizate (and) Caffeine (and) Zinc Gluconate (and) Aesculus Hippocastanum (Horse Chestnut) Seed Extract, D-Panthenol, Radix Polygoni Multiflori Preparata Extract, Grape Seed Proanthocyanidins (Vitis Vinifera Seed Extract), Acrylates/C10-30 Alkyl Acrylate Crosspolymer, Saw Palmetto (Serenoa Repens) Fruit Extract, Horse Chestnut (Aesculus Hippocastanum) Seed Extract, Nettle (Urtica Dioica) Root Extract, Indian Frankincense (Boswellia Serrata) Resin Extract, Astragalus Membranaceus Root Extract, Triethanolamine, Beta-sitosterol, Copper Tripeptide-1, Prezatide Copper Acetate, Crithmum Maritimum Callus Culture Filtrate (CIC2), Pygeum Africanum, Methionine Sulfoxide Reductase, Soy Isoflavones, Phenoxyethanol (and) Caprylyl Glycol (and) Sorbic Acid. I personally decided to use RevivHair as a preventive treatment to avoid future hair loss and to add density to areas where my hair is a bit thinner, just above the forehead and on the temples. In 2 months and with long hair I can't really see if I have more hair growing in these areas, but I can testify that my average daily hair loss has been lower than usual since I started using the serum. No, I don't count the hair I find in the shower drain these days, but I can easily tell by the volume of it. Too much for more than a few days and I enter panic mode. It hasn't happened since I started in May! Less than a month after I had started, I had a (very long overdue) haircut. To my surprise the hair stylist told me: "you have a lot of hair!". Really? That's the first time I heard this comment! I'm usually told that my hair is healthy (it's not color treated and I almost never use heat styling tools, not even a hair dryer), I used to be told that I'm losing a lot of it, but never, ever, was I told by a professional that I have a lot of hair. Now, after just a month of RevivHair treatment, I couldn't possibly have grown new hair the same length as the rest. But I take it as a sign that my hair looked and felt full and dense in the hands of the stylist - which is no small accomplishment considering I have very fine hair! Hubby was a bit too shy to write his own review, so we did it interview style, where I gave him questions and he provided written answers. What you should know: Dr C, unlike his beloved wife, isn't into skincare, haircare, or anything beauty related at all. I converted him to the daily use of moisturizer with SPF, and he complies because his skin isn't tight and dry anymore, but that's the only product he uses that is not some type of cleanser. 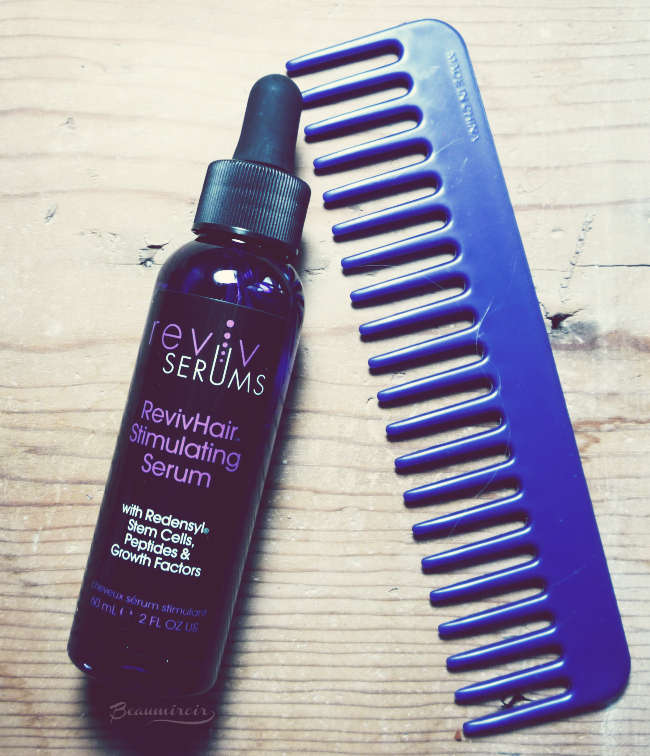 Me: What were your expectations when starting to test RevivHair Serum? Dr C: I had never used a hair restorative product, so I was half expecting amazing hair growth and half expecting nothing to happen. Me: How easy to use was it? What did you think of the packaging? Dr C: Yes, very easy to use. 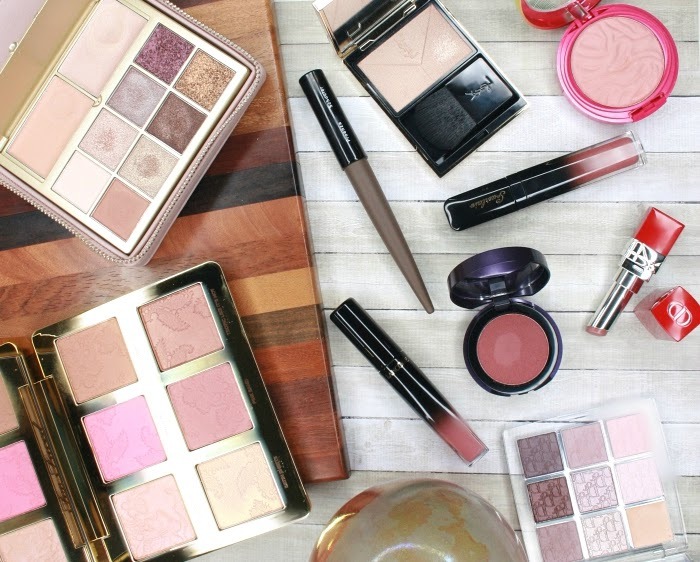 Even for someone who doesn't use (or like using) very many products. Me: Were you tempted to apply it only to half of your head in the name of science, to use the other half as your "control group"? Dr C: Ha! Unfortunately, I didn't think of that. Maybe you have a future in science!! Me: How did it make your hair feel? Greasy, sticky, normal, thicker? Dr C: Fairly normal. It dries quickly and give the hair a similar feeling to a very light hair styling gel. Me: Any thoughts on the texture of the gel, its scent? Dr C: Fine texture. Didn't notice a scent. Me: Did you have any local reaction such as itchy or irritated skin on your scalp? Dr C: No, no adverse reactions. Sightly cooling upon application. Me: Can you describe how you applied it and where? Dr C: One full dropper on the top of the head where the hair is getting a bit thin -- or so I've been told :). Then fingertip massage onto the scalp. Me: Do you see any effect on your hair? On the amount of hair loss, on the quality and strength of your hair, etc? Dr C: I don't see very much hair in the shower drain after I shampoo these days, so it's possible that it's helping with the loss. I also feel like my hair looks a bit stronger, like it has more "body". Me: Would you use it again? Dr C: I wouldn't be against using it again. It did get me thinking about using hair restorative products in general, but I'll probably just go for the comb over, when the time comes. I'm pretty sure I can pull it off. Me: Huh? You're joking, right? Both myself and the hubby enjoyed using RevivHair Serum and were pretty pleased with the effect after 2 months. As with any hair loss treatment, you need to keep your expectations realistic and give it enough time (miracle, overnight treatments don't exist, and those who pretend they do are lying), but I think this is a good formula to support healthy and strong hair. I'll update you guys on the long-term effect after 6+ months, or sooner if I need to! Online on Reviv Serum's website. The price for a bottle is $79, but it's currently on sale for $49! 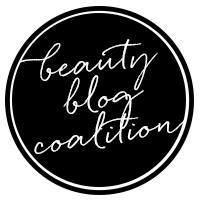 Here's a Beaumiroir exclusive promo code just for you! Valid until July 31, 2016. This is a sponsored post. I received a monetary compensation to write and publish this post, which only reflects my personal opinion. The product was sent by the brand's PR for consideration.